The Faerie Path - NEWS! I have some very interesting news on the Faerie Path series. This just in from the publishers Harper Collins New York - they are planning on releasing an audio version of the series. Cover of Book 6 of Faerie Path Audio Versions. I have only limited information so far, so bear with me while I wait for the Publishers to give me more! 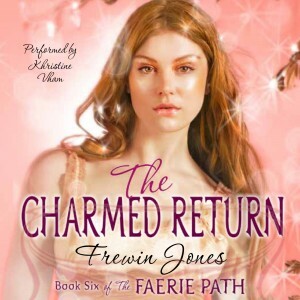 Here’s the audio version of the cover of The Charmed Return. As you will see, the audio has been performed by Khristine Vhan. Khristine is a well-known audio artist, who has worked in TV, Radio and Audio Books, and who is based in New York. She sounds like a good choice. (Bear in mind I haven’t actually hard these audio versions yet - I was only told they exist a few hours ago). I don’t as yet have any dates for release of these versions, nor do I know anything apart from what I have just told you, but I’m hoping to be able to tell you more soon. As someone who really likes audio versions of books, I’m very pleased about this. I love the idea of sitting audio versions of The Faerie Path books alongside my audio versions of Lord of the Rings and Harry Potter and other favourite books. As I said, as soon as I know more, I’ll post about it right here. 16 COMMENTS ON The Faerie Path - NEWS! That’s AWESOME news, Mr. Jones! Wow this is so fabulous! I’m so so excited, I love audio versions of books as well. I travel a lot (by car), and when I do I always listen to audio books. Now I can listen to my favorites (yours!). Can’t wait to hear more! Thanks. YES! This is a dream come true for me. I love audiobooks! Will they do the whole series or just the last book? I don’t listen to audio books, but that is cool! AFJ. I have been shown covers for 5 of the books - from The Lost Queen onwards - so I’m pretty sure they intend to publish the whole series as audio. The only question now is…when??? I am so happy. Now I know what to get my friend next year for her b-day (if they are out by then) but I never listen to audio books I feel its more rewarding to actually read them. anyways I bet your excited! So they started making them without telling you, Mr. Jones? It seems like you should be one of the first to know since they are your books. Also, I was wondering if you could draw any of the male characters from The Faerie Path, like Oberon and Gabriel… Unless you’re too busy, of course! I like all of your other artwork, especially your dragons! AFJ. Opal - I was asked recently whether there would be any more Faerie Path competitions - maybe a competition for readers to submit their own pictures of male Faerie Path characters would be a good idea? Yes… That would be a great idea! That would be cool. I’ve actually drawn a couple pics of the chars for some fansites. AFJ. Nicole - let’s hope the German publishers change their minds. that would be really great - but I believe the books already exist in audio form in Germany. some of them, at least. I really hope it !